Another inventive groom we have today. 28-year-old Chris White proposed to his girlfriend of two years, Tamara (Tam) Diamond, on a picnic at Perth’s Kings Park – where it all began. The answer was of course, yes, and the pair went about organising a classic and elegant wedding styled with graceful simplicity and a hint of rustic charm. 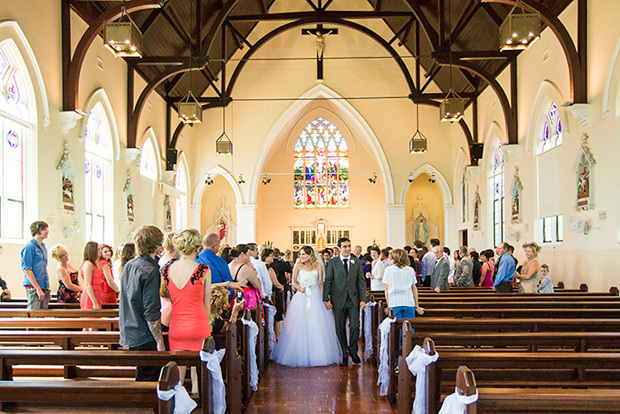 They said ‘I do’ in front of 130 family and friends at St Mary’s church in Leederville, WA and a sit-down dinner was held at the colonial-style Bridgeleigh reception centre, set on 10 acres of natural bushland. Never mind! Mrs White, you look amazing in your vintage-inspired couture gown by Baccini & Hill. Congratulations to you both. Harmonising with the bride’s tulle gown were these heavenly Evelyn Miles designer peep-toe pumps. The Serenity style is a classic satin bridal shoe with a dainty tulle wrap and 12cm stiletto heels. Chris was dressed smartly in a charcoal peak lapel three-piece suit by Kenneth Blake, worn with a white shirt and black tie. The look was completed elegantly with a simple white rose buttonhole. On a trip to Melbourne for a family birthday, Tam visited Melbourne designer, Baccini & Hill and fell in love with the first dress she tried on. It was the Azzure gown with a delicate Chantilly lace bodice and full tulle skirt to which she said ‘I do’. Her gorgeous earrings and hair comb were from the same boutique. 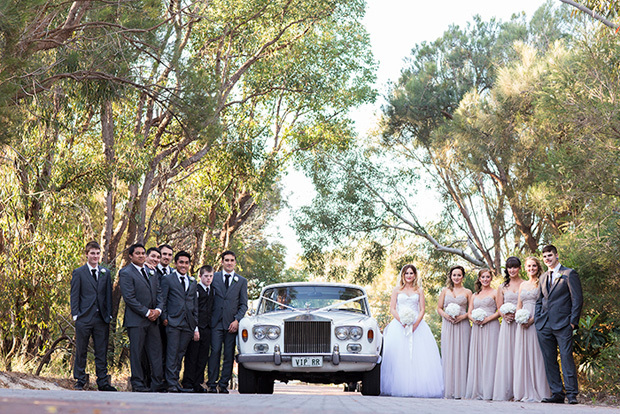 “We had a Rolls Royce 11-seater stretch limousine and a Rolls Royce sedan,” says the bride of their classic wedding cars, by Richmond Palace Limousines. 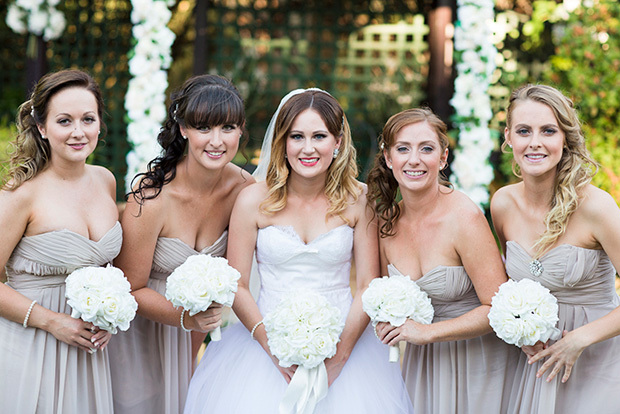 Tam sourced her bridesmaid dresses online and chose full length strapless chiffon gowns in a lovely muted tone for their elegant wedding. The reception began with canapes and pre-dinner cocktails while photos were being taken, followed by a formal sit-down dinner and a dessert buffet afterwards. The couple’s beautiful three-tier wedding cake was a layered chocolate and white chocolate creation by Glory Box Cakes.